This week has been a busy one for everyone. It seemed like we had lots of time to get decorated and ready for Christmas and suddenly we don’t. Or at least that’s the way it seems. 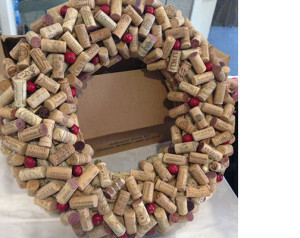 The Festival of Wreaths was a big success. Always a good kick off to the season. Then we had Stroll Weekend and now a round of holiday events. Every year I attend the party at The Homestead – always joyful. Music by the ShepCats – makes the party quite lively. What I like most about this yearly party is that it reminds us of how our community reaches out to all generations and doesn’t forget the elderly. In the midst of a lot of commercialism this party, attended by many friends and relatives of all ages is very much a local affair. 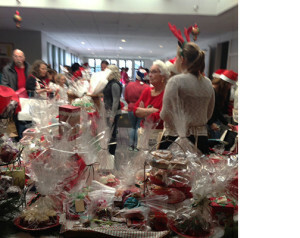 On Saturday there was December Delight at Nantucket High School – bigger and better than ever! 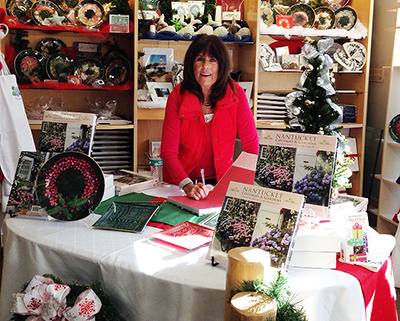 And the always wonderful craft fair at the old Nantucket Yacht Club to benefit The Lighthouse School. Many people I talked to have had their trees up since the day after Thanksgiving, others are just getting to it. Peter Greenhalgh, sales director of the Artists Association of Nantucket said he put up his tree exactly two weeks before Christmas and it takes two days to rearrange the living room and get all 65 heirloom ornaments onto the tree. This is why I start right after Thanksgiving and do it a little at a time. Of course by now all my Poinsettia plants are wilting and have to be replaced! 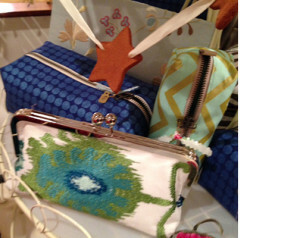 WINK at Preservation Hall Craft Show during Stroll. I’ve been asked to write a new craft book on quick and easy quilts. Titles for new books are always difficult. While planning out the contents I decided I liked the rainy day concept. It implies a warm and cozy activity when you’re snug in the house and can’t do anything outdoors. It also suggests quick because you have limited time, and easy if it’s a project you can make in a day. After much back and forth with my agent and the editor we settled on 4-hours as the maximum attention span allocated for a project. Not an easy challenge! But with Christmas on the horizon who might like to whip up a last minute gift or decorations. If you like making small fabric crafts these mini stockings are perfect for using up scraps of material. Now for some tips to decorate easily, with no- or low- cost materials. This is an opportunity to get out all your good things that you might have inherited. Never could justify getting rid of your mother’s silver teapot even though it’s a pain to polish? Here are ways to put those things to good use in order to justify not giving them away even though they take up valuable space. Polish anything silver; a tray, tea set, candlesticks, etc. They make great holiday props. Group fat white candles on a silver tray with a few small vases to hold greens. Fill a teapot with evergreens and red rosebuds. Silver candlesticks are absolutely perfect for Christmas. Mercury glass vase or candlesticks pick up and reflect light. Fill a lovely bowl with scallop or fairy tree lights and place on a table. Put fat candles into any unusual glass or silver containers and group them together for maximum impact. A miniature artificial tree covered with lights and a garland of popcorn or cranberries in a guest bedroom, bathroom or on a step. Great way to light up a drab corner. Simple “around the house” decorations: fill a basket with red and green balls of yarn or spools of thread. In fact get out every that is red and make an arrangement on a table. Be creative with unrelated items. One year I filled a vase with a red mixing spoon, red knitting needles, a couple of holly branch with red berries from my yard, and a small teddy bear with a red cap and a toy truck hanging from the holly. 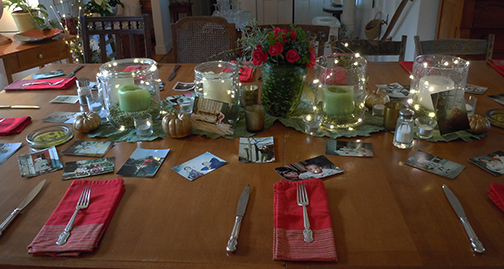 Use remnants of ribbon, too small for packages, to tie on the tree or around napkins for Christmas entertaining. Recycle Christmas cards you receive by cutting them up to use as package gift tags. You’ll never run out. Put remainders in an envelope and put away with the Christmas decorations for use next year.